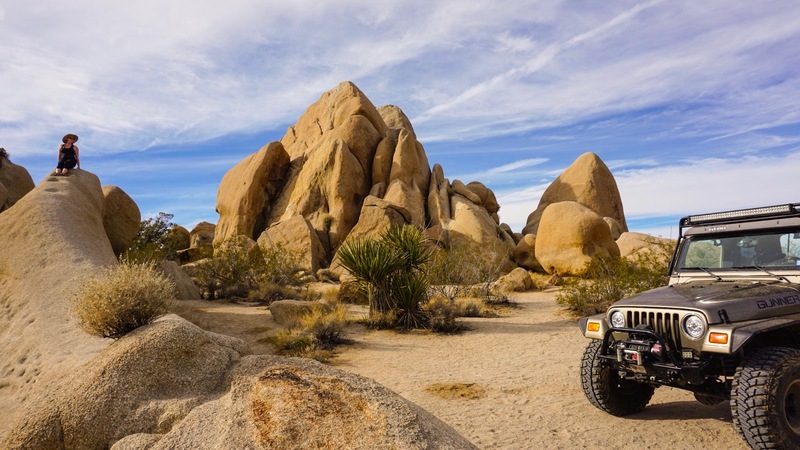 Joshua Tree National Park has been on the list of must-do stops since we hatched this crazy plan. 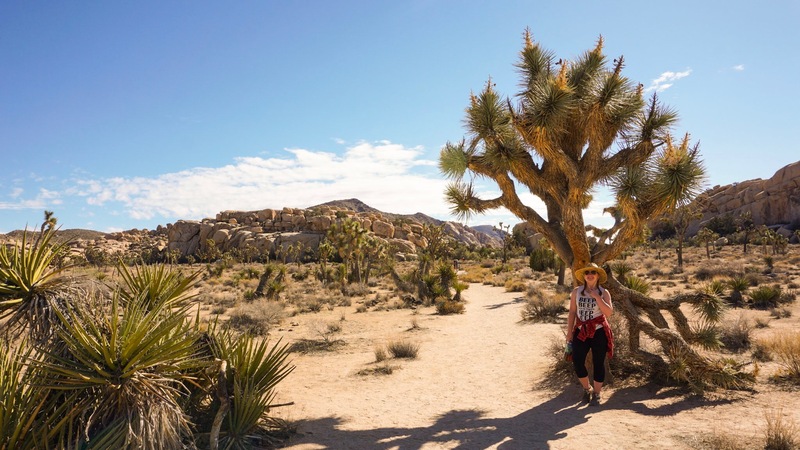 It seemed like every RV travel blogger I follow had stopped at Joshua Tree and everyone seemed to love it so much that they stayed much longer than they had originally intended. We heard similar reports from friends and family. 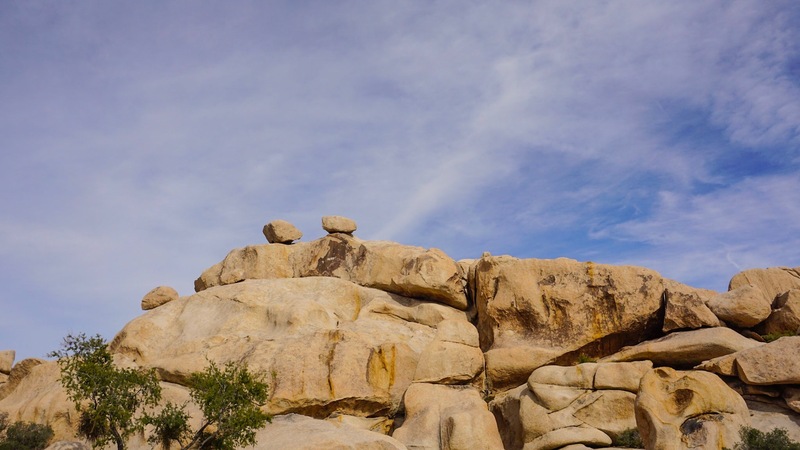 Some of our favorite California to Texas expats used to love spending long weekends camping at Joshua tree. We didn’t really know what to expect, yet still had high expectations. Thankfully, I can report that we are now total converts. 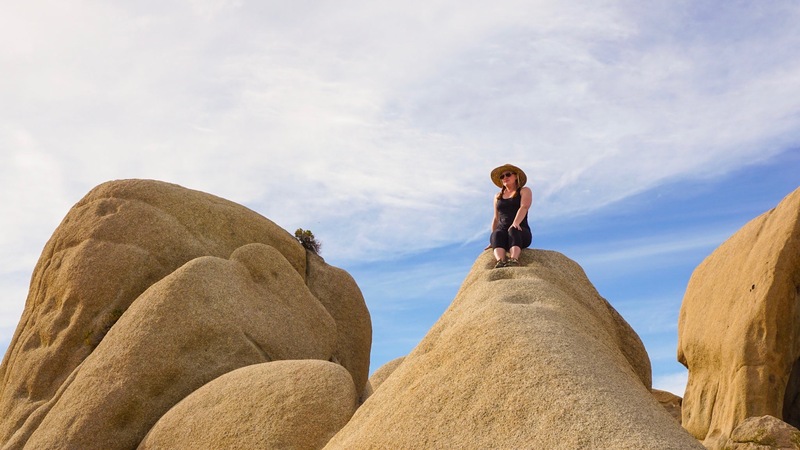 Joshua Tree is like a whole different world and it is amazing. I’ll start with our campsite. 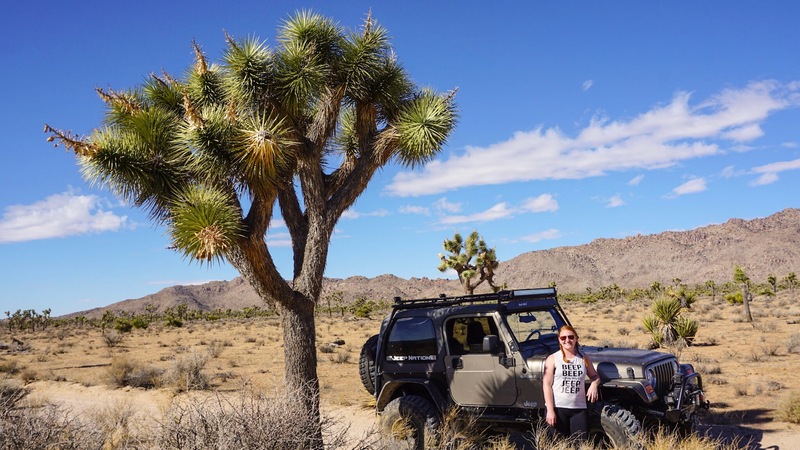 We stayed on some BLM land between the town of Joshua Tree and the military base at Twenty-Nine Palms. We were only about five miles from the north entrance to the National Park. It was super convenient for going into town, as well as touring the park, yet felt completely isolated. It was perfect. 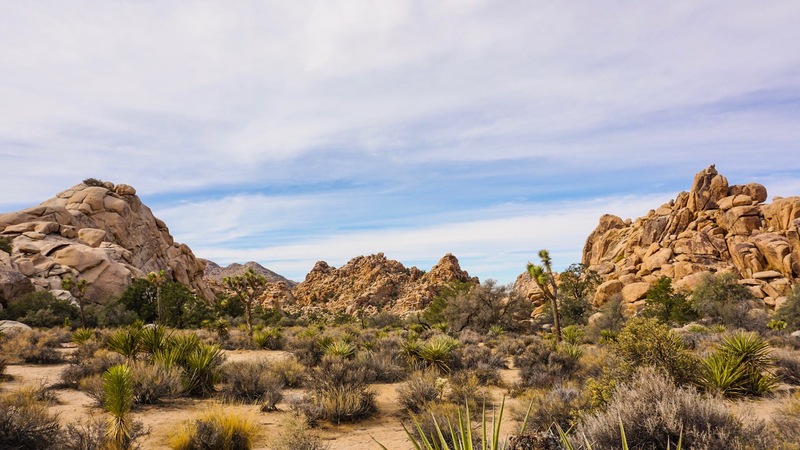 This area of BLM land is often referred to as North Joshua Tree BLM or the Joshua Tree Lakebed. 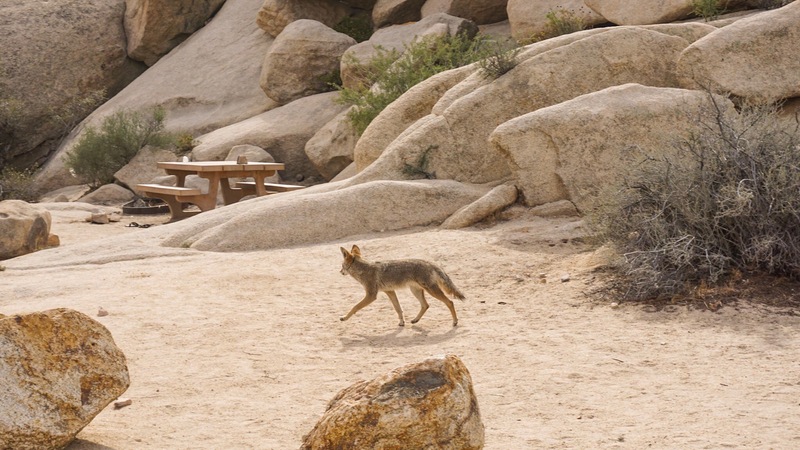 I also found one website that called it Coyote Lake. 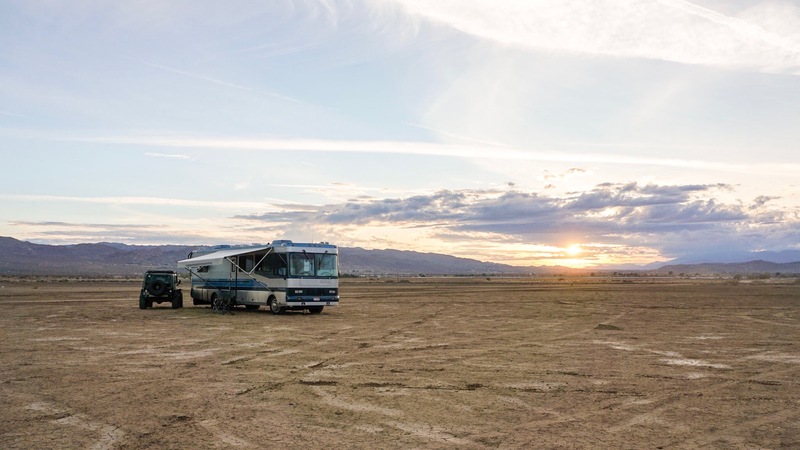 Essentially, this is a huge dry lakebed that is completely open for RV camping, tent camping, off-roading, hiking, etc. There is no gate, no fees, no designated campsites, and no utilities. 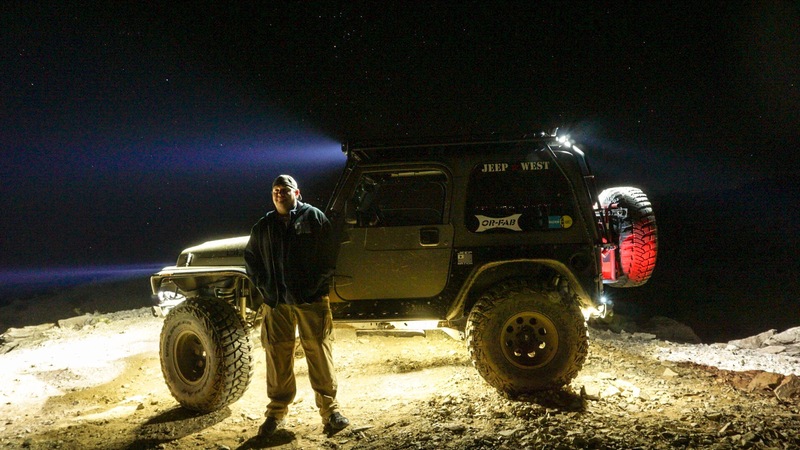 We parked the RV on the main road and used the Jeep to check out the area and find a place to park the rig. The last thing we wanted was to get our giant motor home stuck in the sand. 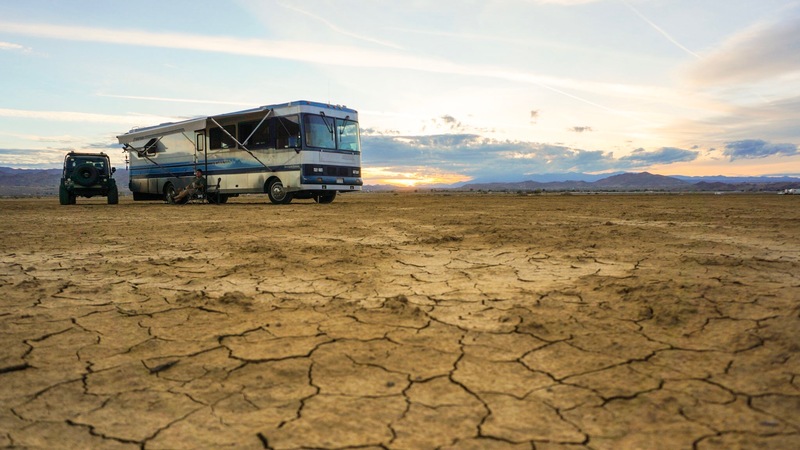 Luckily, the ground was very dry and well compacted so we had no troubles driving the RV out onto the lakebed. This might be a tricky spot to camp during a rain storm as I suspect it all turns to mud very quickly. We saw evidence of lots of people having been stuck. We drove out as far as we felt comfortable and settled in. We arrived on a Saturday and had a few (very distant) neighbors but by Sunday night we had the whole place to ourselves. Incredible. If you want to find this place yourself the GPS coordinates are 34.1658, – 116.2287. There are also numerous reviews and descriptions of this place on the internet. 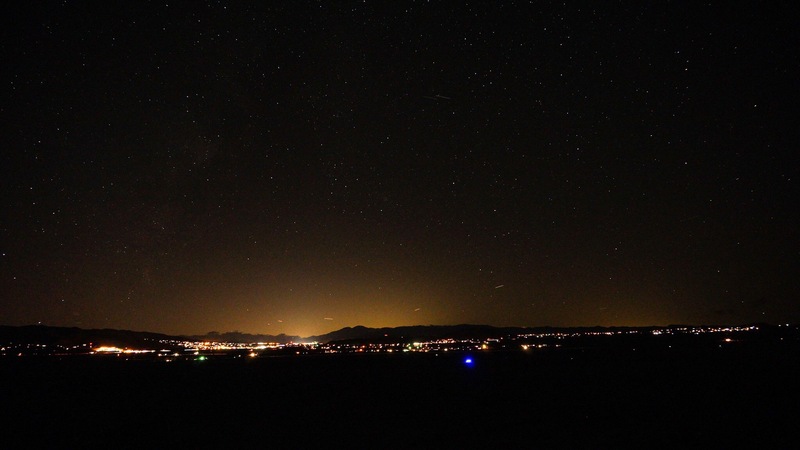 Most reviews suggest taking Cascade Road from the Twenty-Nine Palms Highway. This is terrible advice. Cascade Road is all dirt and unmaintained. Take Sunfair Road instead. It is paved and runs exactly parallel to Cascade Road, making this a much easier drive in an RV. Cut over to Cascade road on Broadway (also paved) and you will drive straight into the BLM camping area. A bunch of the online reviews of this place complained about the noise from all the ATVs, dirt-bikes, and Jeeps driving around. We read this and instantly saw it as a plus. 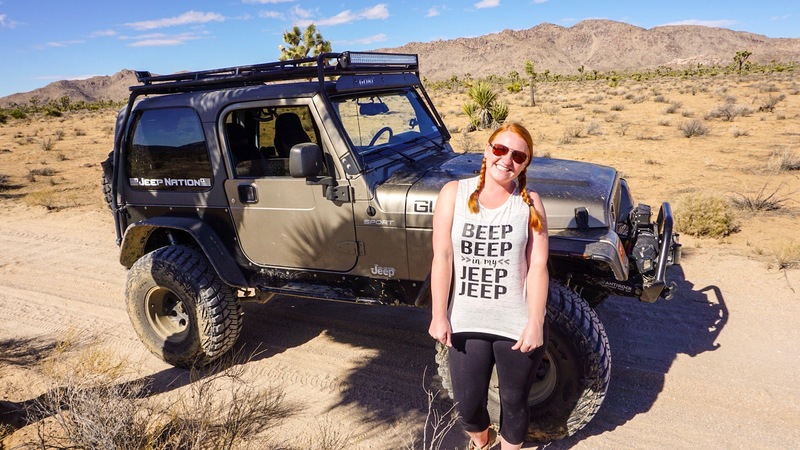 We could find Jeep trails leaving right from our campsite! The lakebed is surrounded by hills, all drivable BLM land for just about as far as the eye can see. If you drive far enough you will eventually run into the edge of the Twenty-Nine Palms Military Base but we never went quite that far. 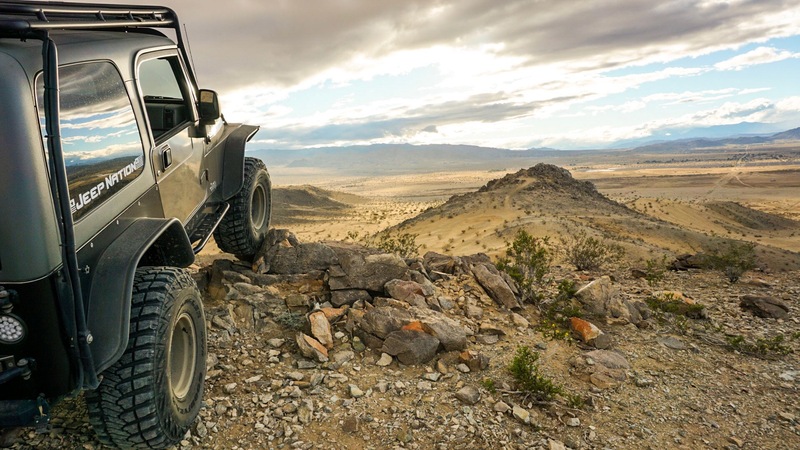 During the day, the hills are busy with ATVs, dirt bikes, and various other off-road vehicles. After dark it was just us. 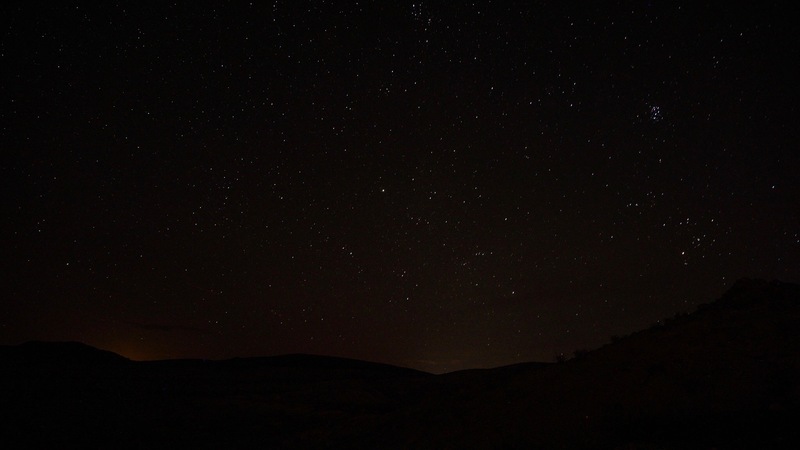 The clear desert skies and remote location was an excellent location to try out some night photography. We haven’t done a lot of night photography but we think these turned out pretty well! 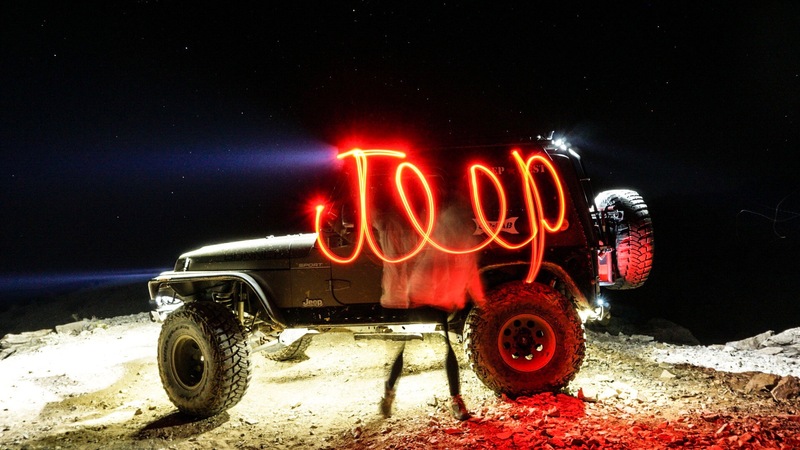 I used the red light setting on my headlamp to spell out “Jeep” during a long exposure on the camera. I had to write backwards, which took a few trys to get right. 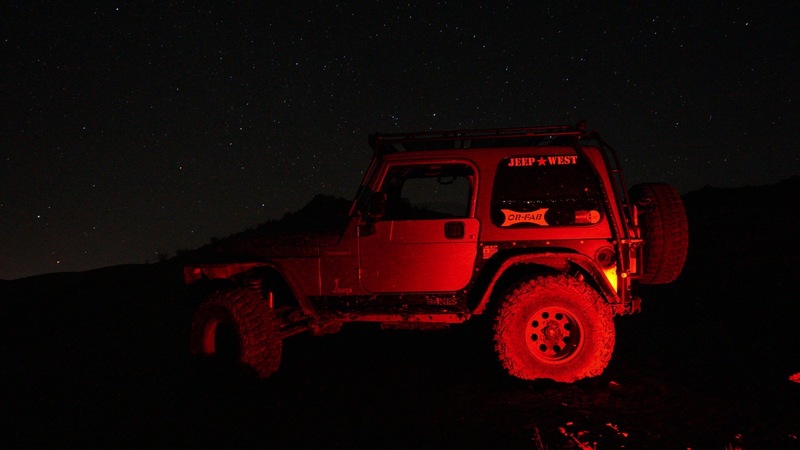 We then used the red lamp for ground lighting and it looks like we’re on Mars! We spent our first day in the area just enjoying the solitude of our camping spot. I think we both needed a little down time after the hustle of Universal Studios. 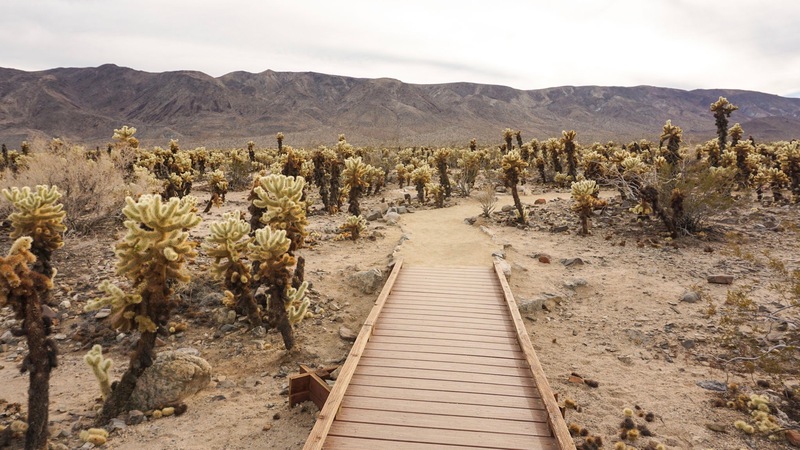 But then it was time to go see what everyone had been raving about: Joshua Tree National Park! 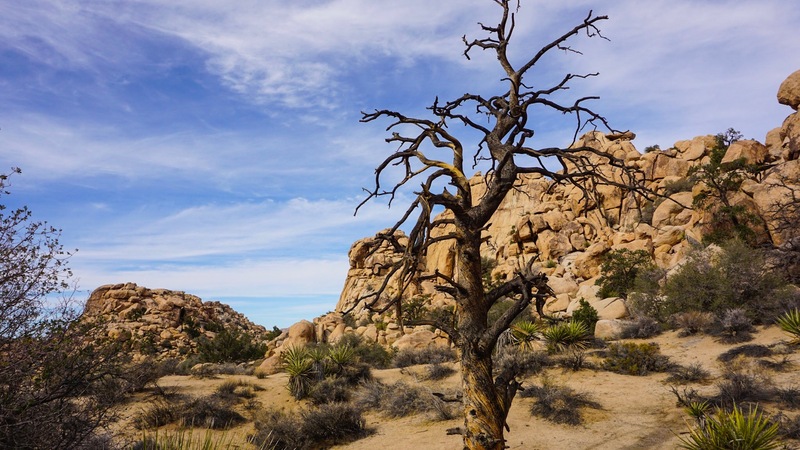 Joshua Tree is named after a funny little desert tree that reminds me of a something out of a Dr. Seuss book. 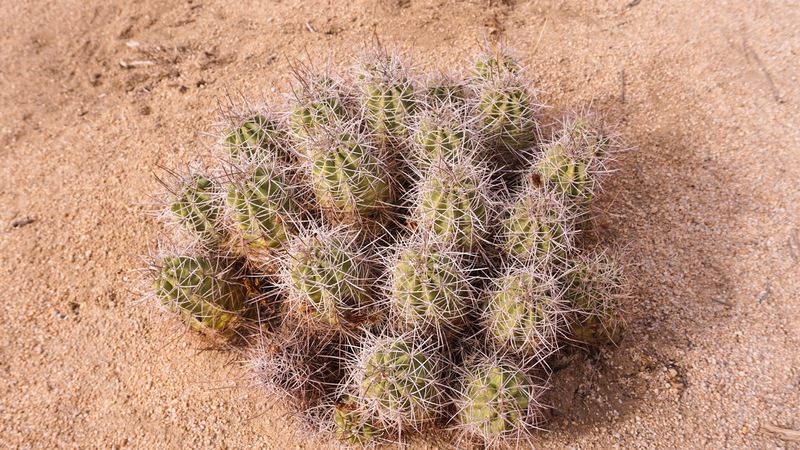 Joshua Trees have spiky, succulent leaves and are actually a member of the agave family. 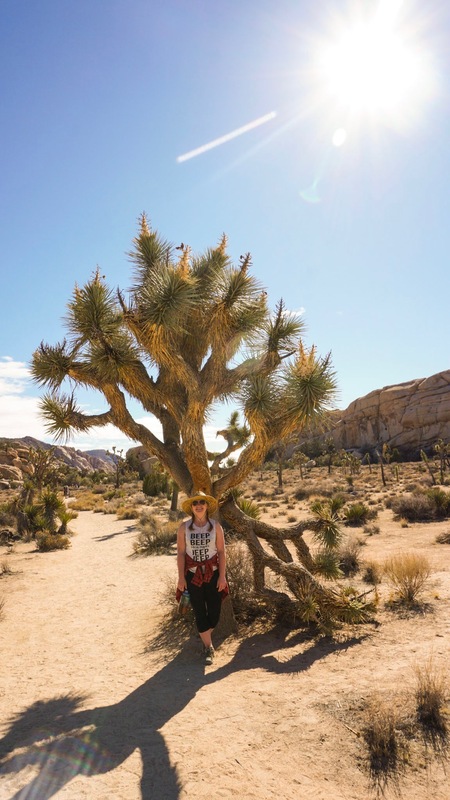 Joshua Trees are fibrous inside and have no growth rings, making it very difficult to determine their age, but some scientists think they can live up to 150 years. 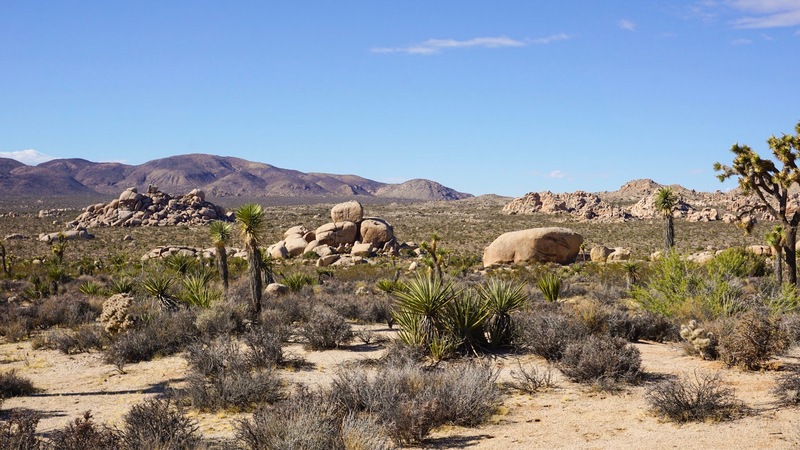 Because of their fibrous insides (used to store water in times of drought) a dead and dried Joshua Tree log is very light, almost like a very dense styrofoam. 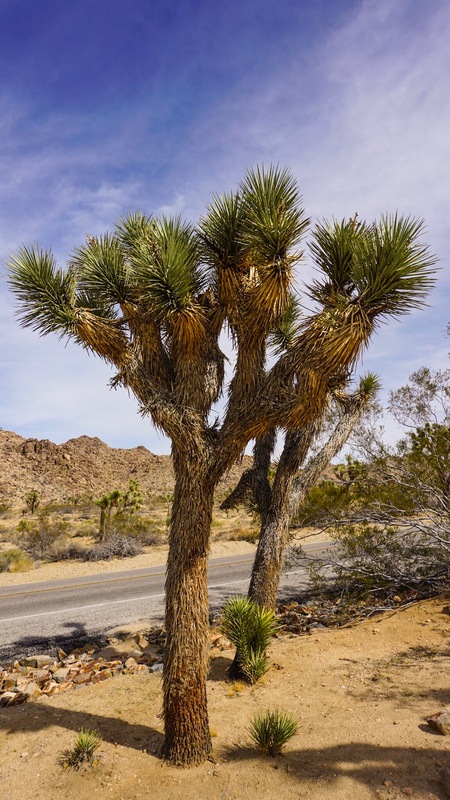 The name of the plant comes from a Mormon legend in which early Mormon pioneers came upon the trees and thought they resembled the outstretched arms of Joshua leading them to the promised land. The name stuck. 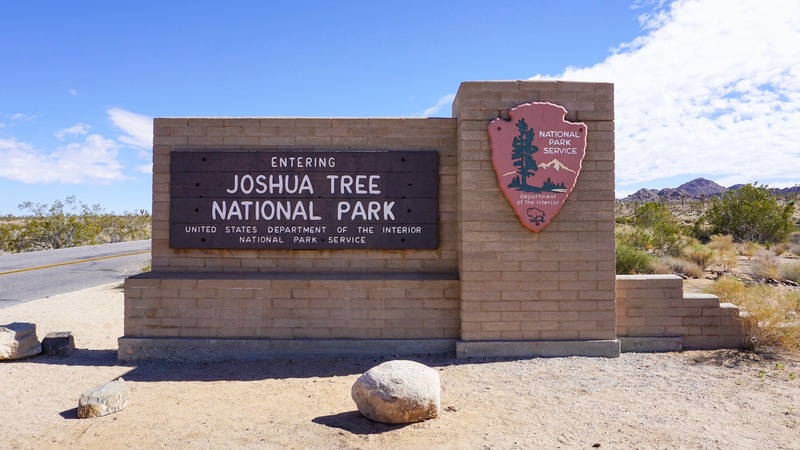 The funny thing about Joshua Tree National Park is that Joshua Trees are not found within the entirety of the park and this is not even the only place you can find Joshua Trees. 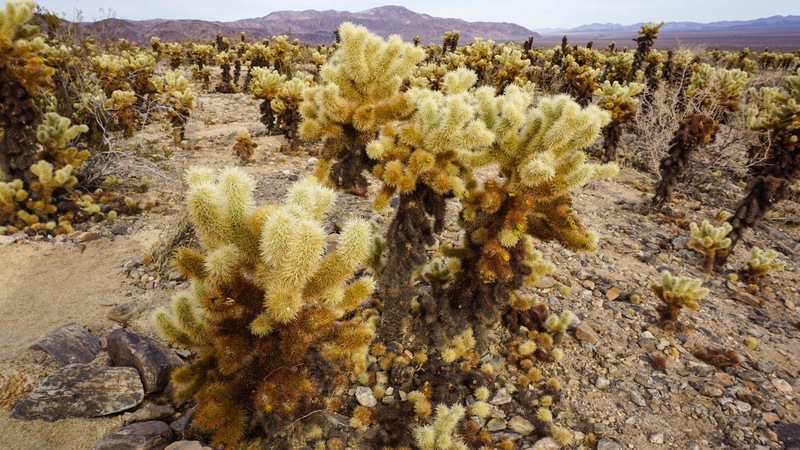 They actually grow throughout much of the Mojave Desert. 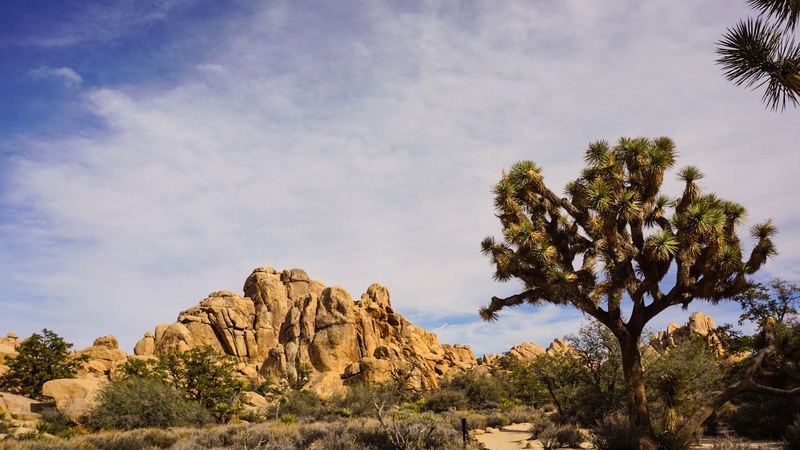 Driving from LA you will start to see Joshua Trees long before you get anywhere close to the park. 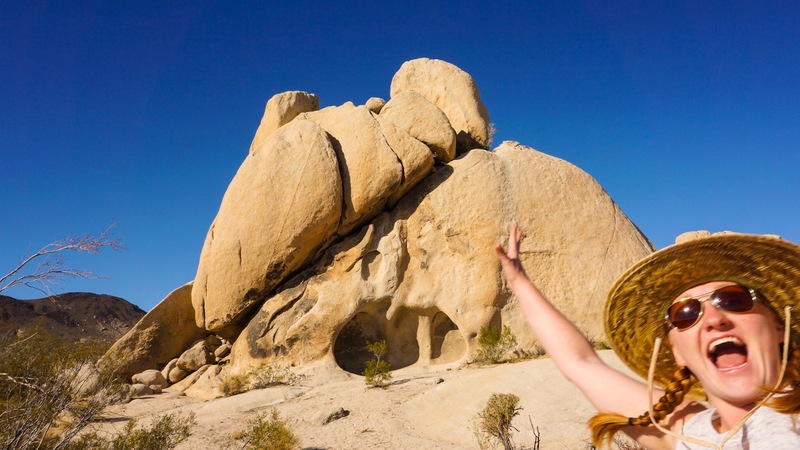 Personally, I found the rock formations within Joshua Tree to be much more intriguing than the trees. 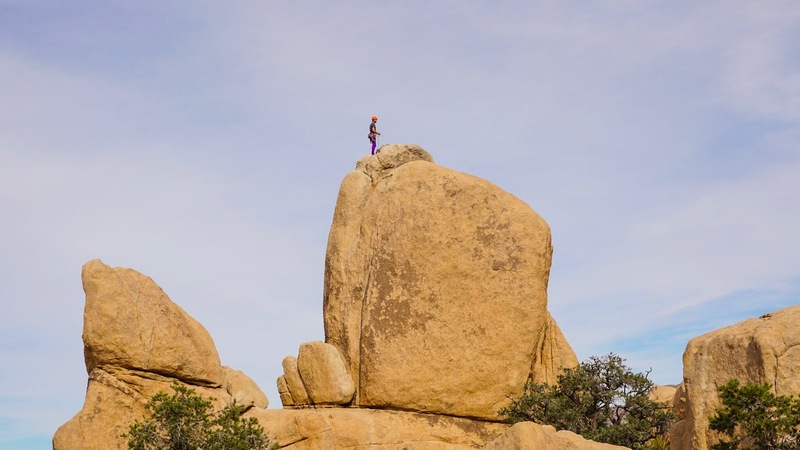 The huge boulders are placed so precariously that you can almost imagine they were placed there by giants. About 250 million years ago—before the dinosaurs came to dominate the planet—the thick North American plate began riding over the thinner Pacific plate. The water-rich oceanic plate was forced under the continent at an angle. Water at depth, where temperatures are extremely hot, helped to melt the rock into granitic magma. 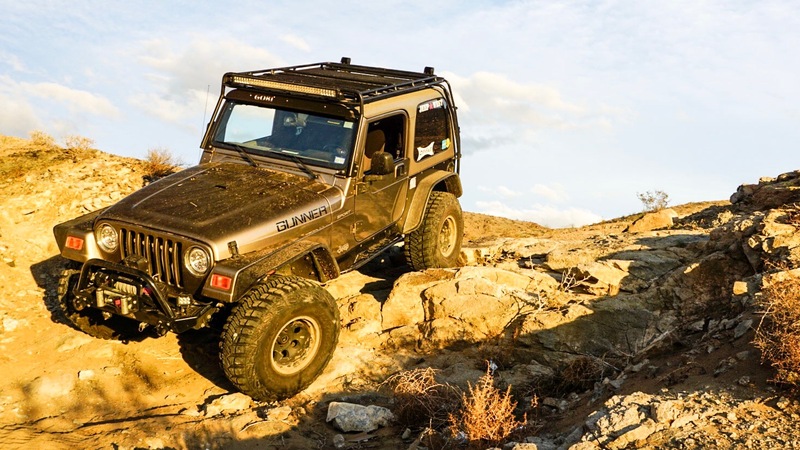 It was hot, liquid, and lightweight, and was able to ooze upward along deep-seated cracks in the crust that had been fractured by the fierce crunching of the charging plates. 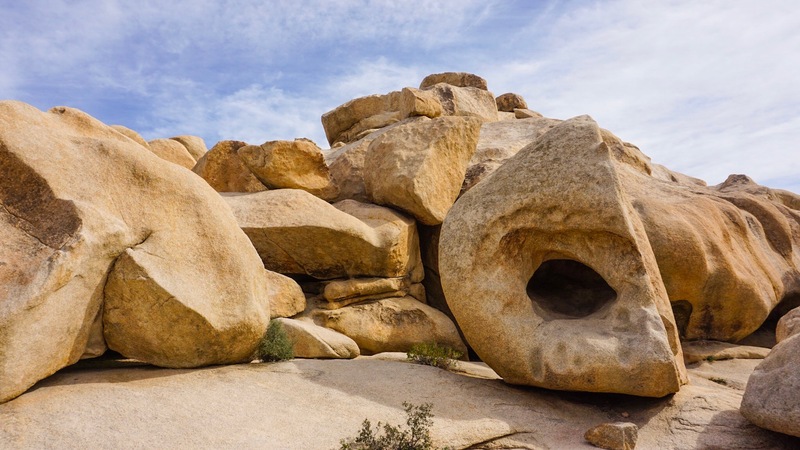 The liquid granite couldn’t force itself all the way up to the surface, so the granite stalled and formed huge, ball-shaped masses within the ancient rock. 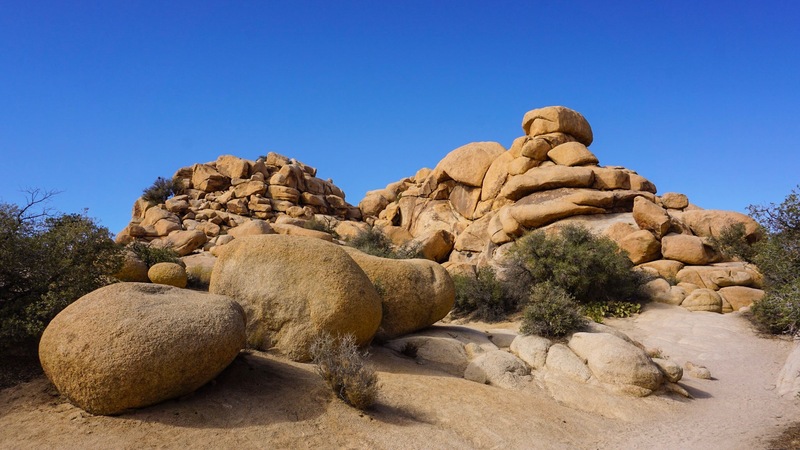 Over a long period of time, the great globs of granite cooled and hardened. 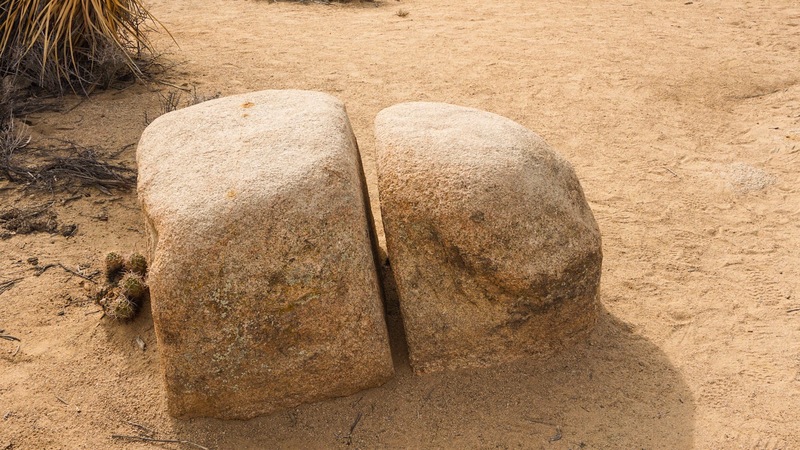 The ancient rock, called gneiss (pronounced “nice”), began to erode. 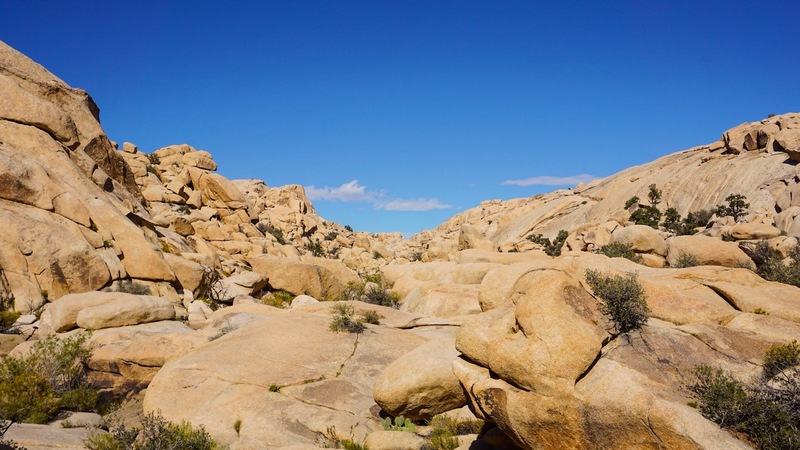 Over millions of years, the gneiss had completely vanished from the surface in most of the park. The gneiss, dark in color, does remain exposed on mountain tops. Younger and lighter-colored monzogranites are seen in the valley bottoms. So what about all the crazy shapes and rock formations? How did they come to be? 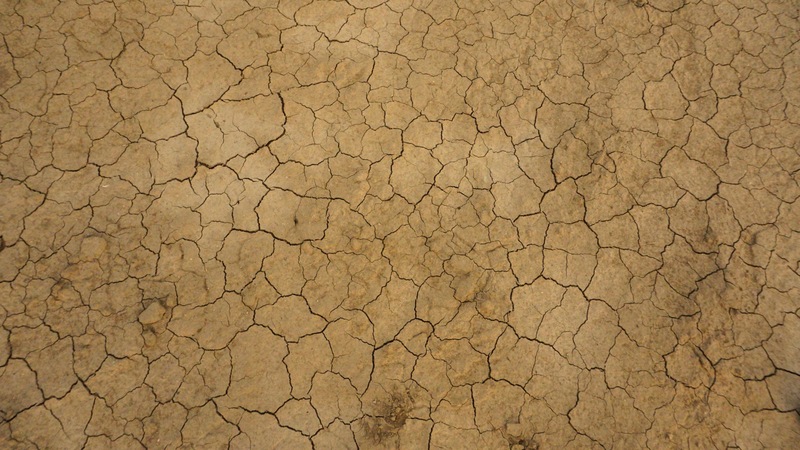 Cracks in the rocks and water are the keys to the appearance of our rocks today. Horizontal stresses from the collision of tectonic plates created sets of parallel, vertical fractures within the buried rock. Later, mountain building pushed the rocks upward to form sets of X-shaped cracks standing at angles in the granite. 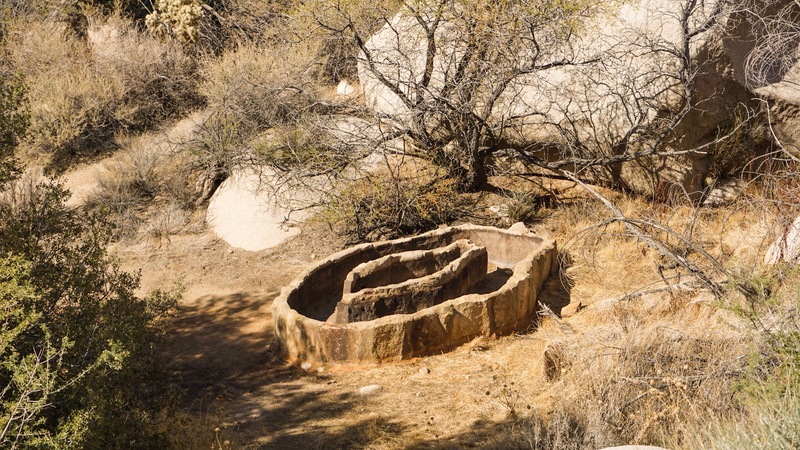 All the fractures were avenues for rainwater to seep downward through the rocks to etch and shape and round the originally angular blocks into the varied forms seen today in the park. 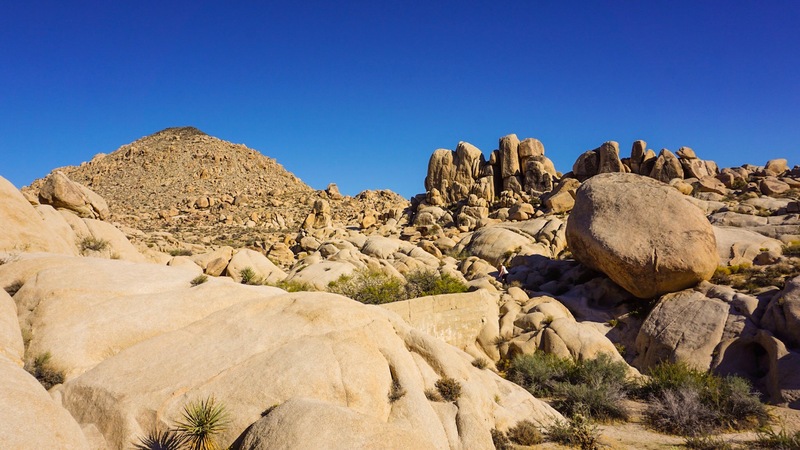 Due to the unique rock formations and excellent grip of the granite, Joshua Tree is incredibly popular with rock climbers. 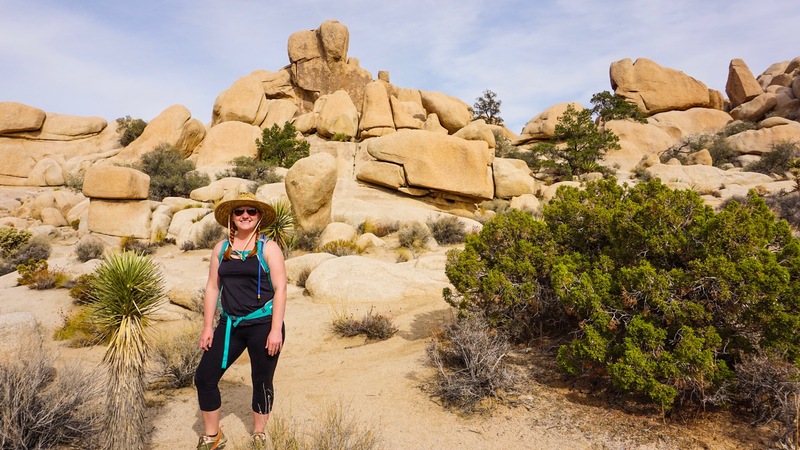 We ended up wandering through the Hidden Valley Campground while looking for our hiking trail and noticed that just about everyone camped there was geared up for rock climbing. The notice board at the front of the campground was full of people looking for climbing partners or trying to track down friends they had met at other climbing destinations (usually Yosemite). The bravest coyote I have ever seen. They usually run at the sight of people. This one seemed more concerned about raiding the remains from breakfast. The trail we were looking for was actually just across the road at the day use area. 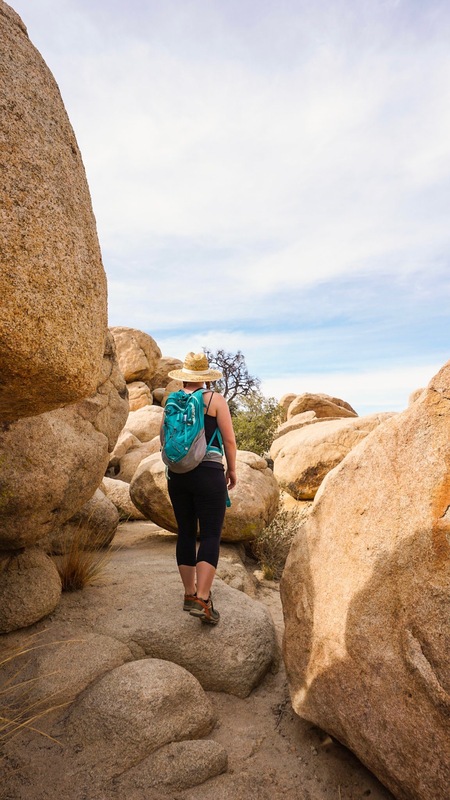 The Hidden Valley Trail is an easy 1-mile loop the winds through the massive boulders down to a valley that was supposedly a favorite hiding spot for old cattle rustlers. 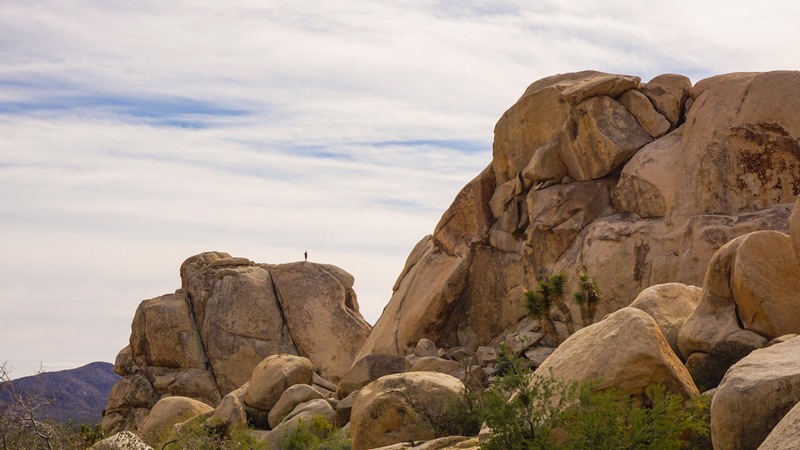 Something that makes Joshua Tree particularly interesting is the history of people who made use of this arid landscape. 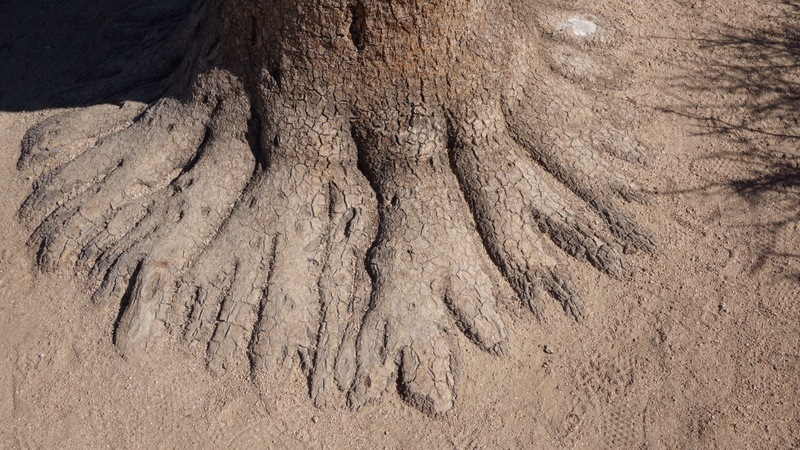 Throughout the park you can find evidence of humans, both ancient and recent. 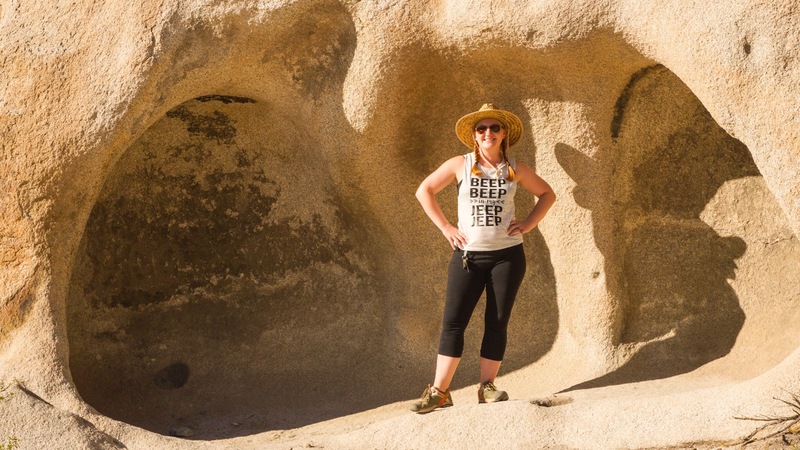 There are wells built by ranchers, rusty cans and pieces of metal left by the cattle thieves, and petroglyphs on the rock walls from Native American tribes. We stopped for lunch at a picnic area just past Jumbo Rocks. 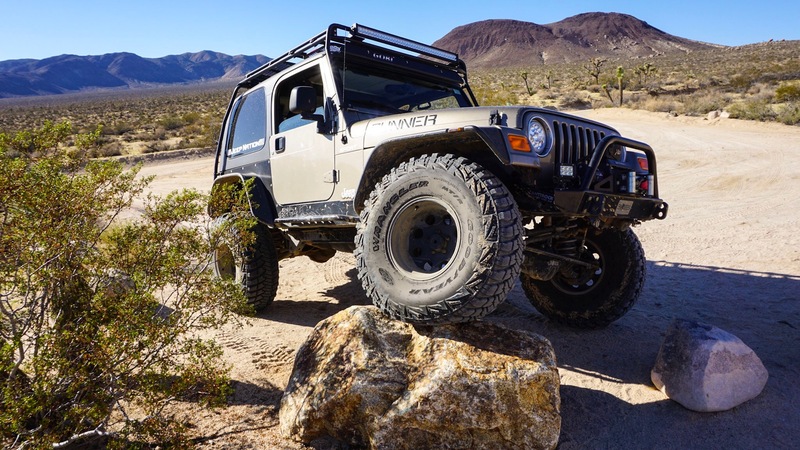 It’s as if these rocks were just made for climbing! After lunch we went on a short walk amongst the rocks. 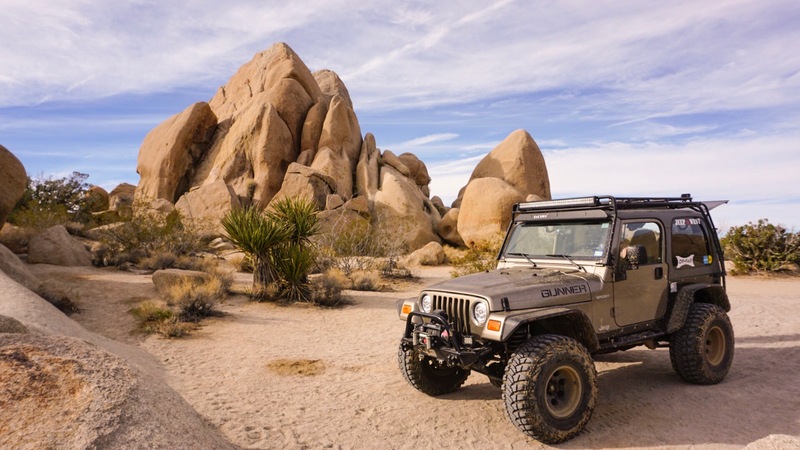 Part of the fun of Joshua tree is that you don’t actually need a trail. You can just wander into the rocks and explore. But make sure you don’t wander too far and aways keep your bearings. Everything starts to look the same very quickly, making it easy to get lost. 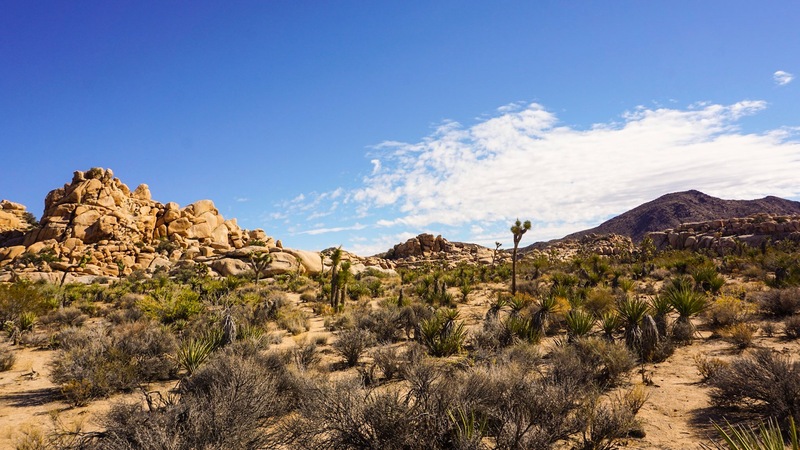 Joshua Tree is actually made up of two distinct deserts, the Mojave and Colorado. 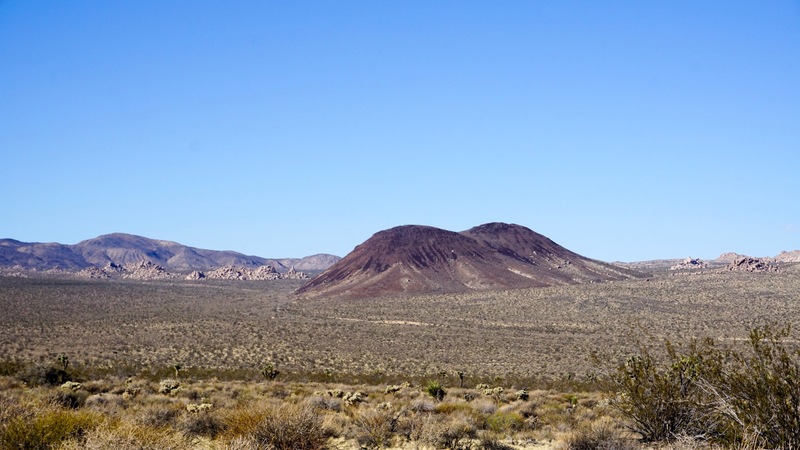 The western side of the park (and our camping spot) are part of the Mojave desert. 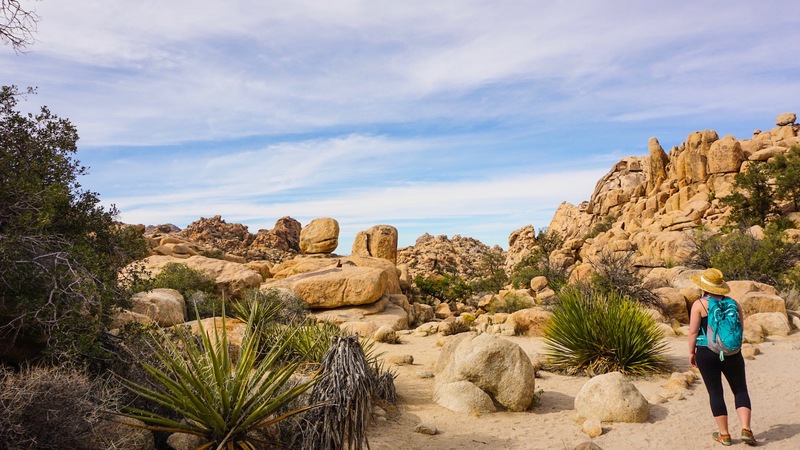 This desert is around 3,000 feet above sea level and is where you find the giant boulder piles and Joshua Trees that made this park famous. 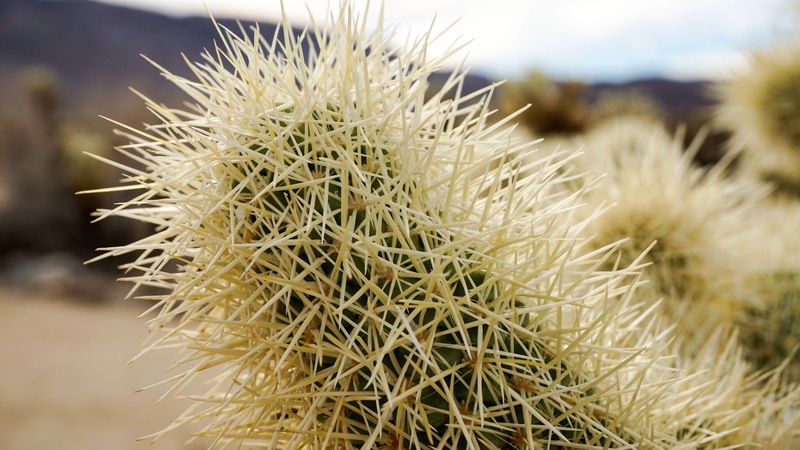 The lower elevations found in the eastern Colorado desert are home to a strange plant called the Cholla Cactus. 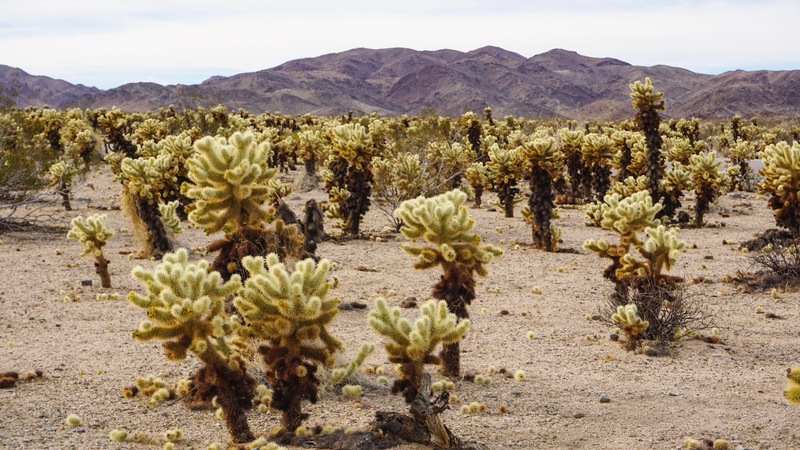 We didn’t venture very far into the eastern side of the park, but did drive far enough to see the Cholla Garden, a dense field of the prickly cacti. 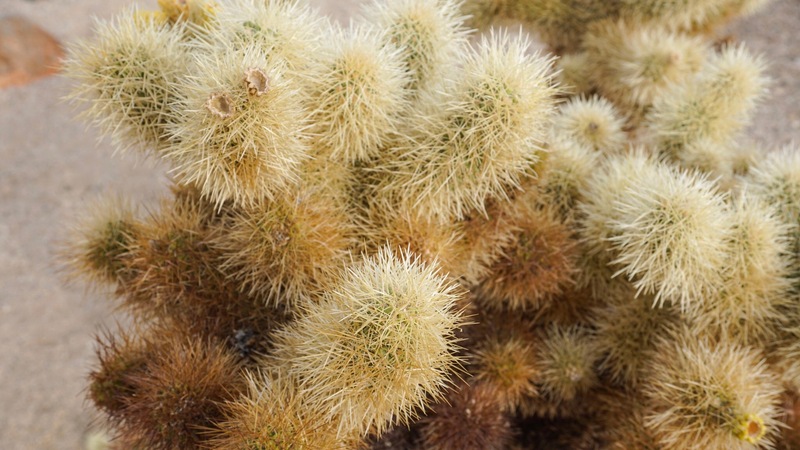 This plant is sometimes called the Jumping Cactus because if you get too close the barbs seem to jump out and grab you. The dark, dried up lower half of each plant makes it look as if a wildfire went through the area. 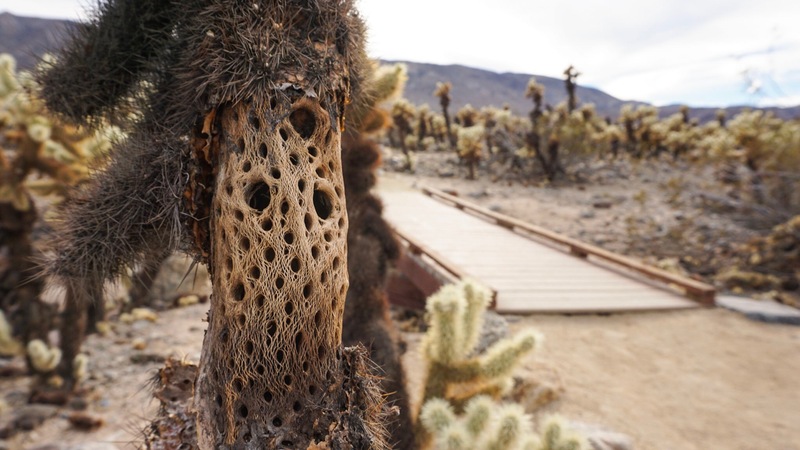 In reality, this is just how the Cholla grows. 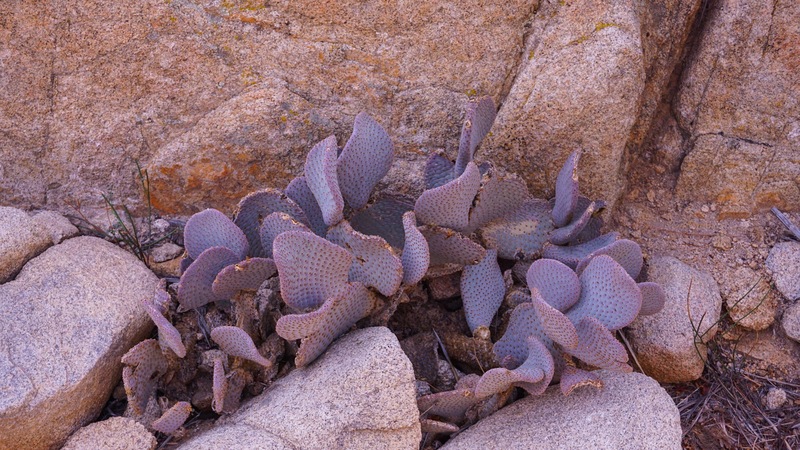 The bottom of the plant dries up into a woody stalk while the succulent branches continue to grow from the top. On our way back from the Cholla Garden we saw a white car pulled over on the side of the road and two people staring at the ground. We too saw the little brown creature and pulled over immediately. 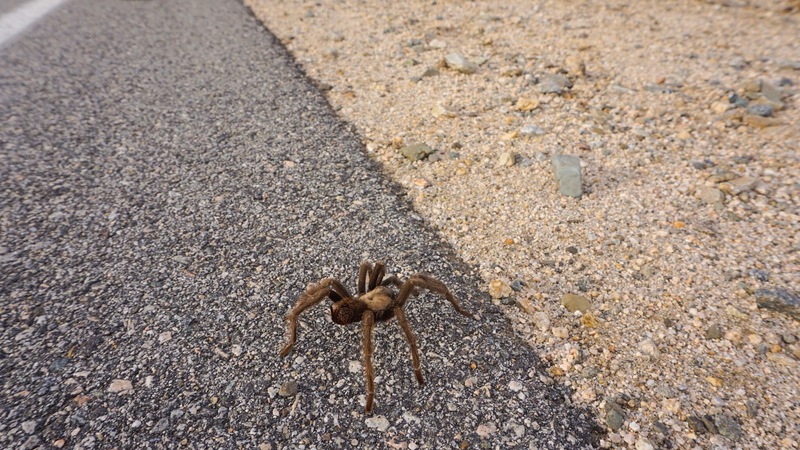 They quickly waved us over, just as excited as we were to actually find one of the elusive Joshua Tree tarantulas! Funny enough, they had also driven all they way from the Pacific Northwest. They were from Seattle and this was their first trip to the deserts of the southwest. We had been hoping we would find of these guys. They spend most of their time underground in their burrows, only venturing out to hunt, but October is their mating season. During the mating season males wander much farther from their burrows in search of a mate. 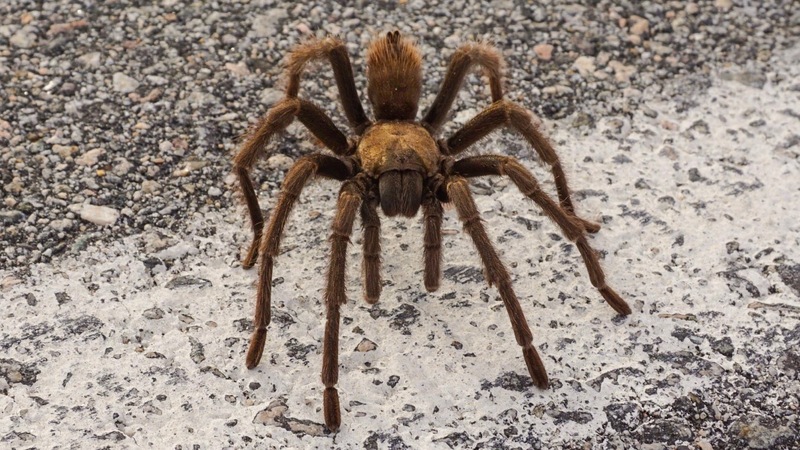 When the male finds a female tarantula’s burrow he will tap his legs on the ground to get her attention and see if she wants to mate. 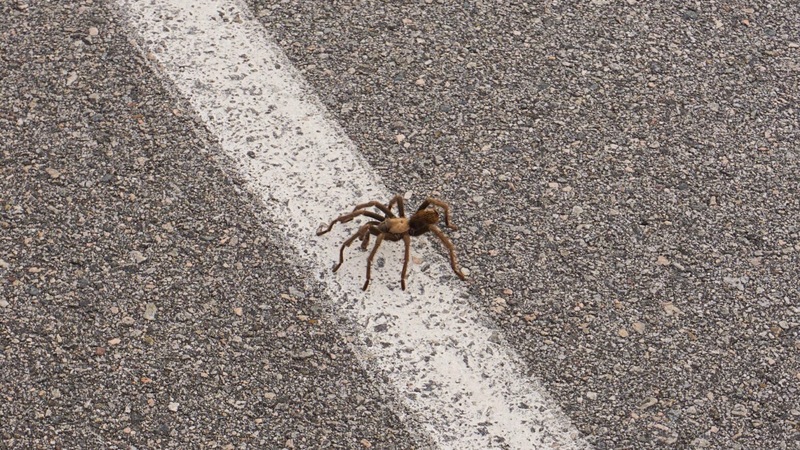 The chances of seeing a tarantula above ground are much greater during this time. We didn’t get nearly as close to the spider as the photo below suggests. We kept a safe and respectful distance. We didn’t want to freak the little guy out. I had also heard that they jump, which might have really freaked me out. Although these spiders will bite people, they are not deadly. I read that most people react similarly to a bee sting. 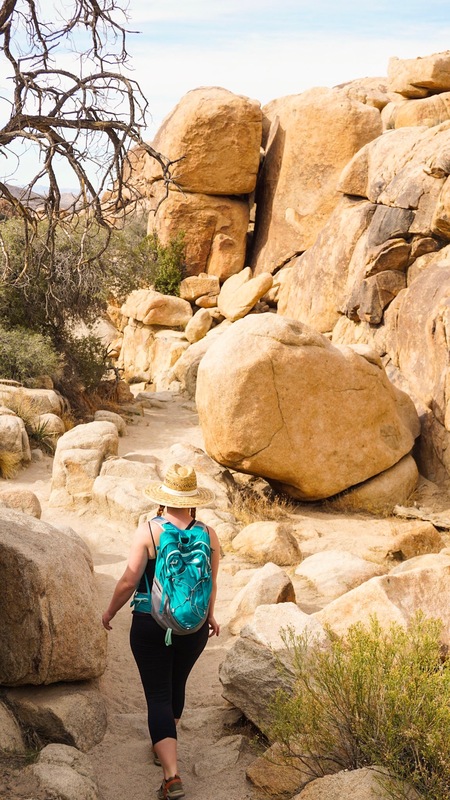 The next trail we hiked was to Barker Dam. In the late 1800s and early 1900s this area was being settled by some very tough and very industrious people. They were raising cattle and mining for gold. None of their endeavors were particularly successful but the remnants of their settlement can be found within the park. 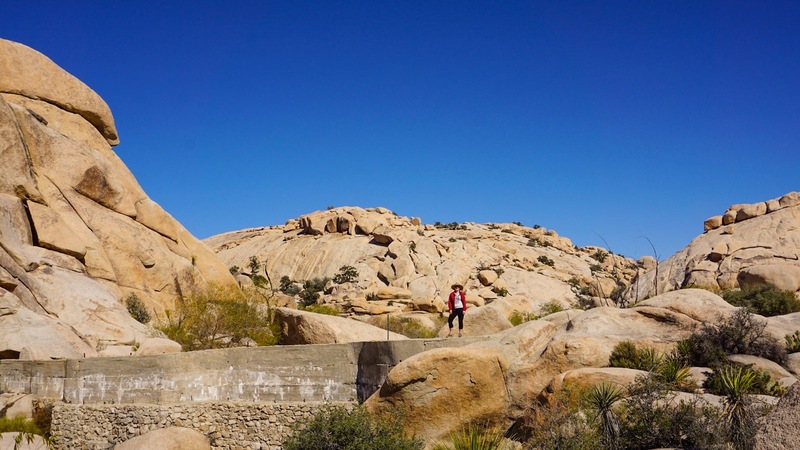 The Barker Dam was built around 1900 to hold water for cattle and mining operations. Today, the small remaining rain-filled reservoir provides water for local birds and wildlife. We found this structure just beyond the dam. We’re not sure what its use was. 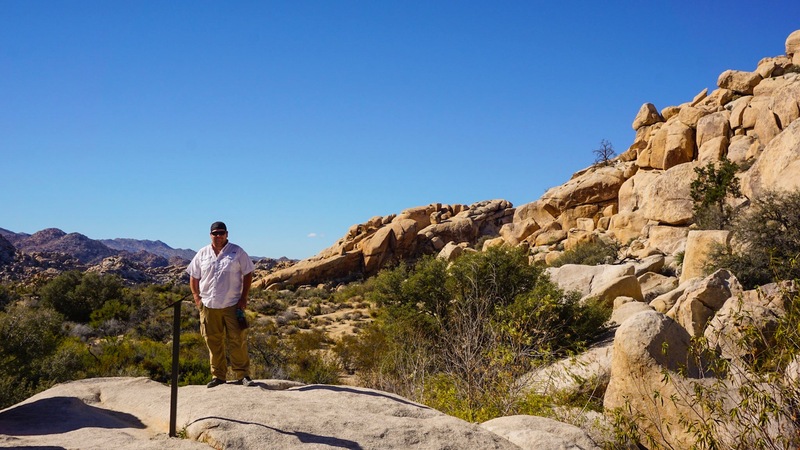 The Barker Dam hike is an easy hike that most people can do. It is mostly flat and only a 1-mile loop. 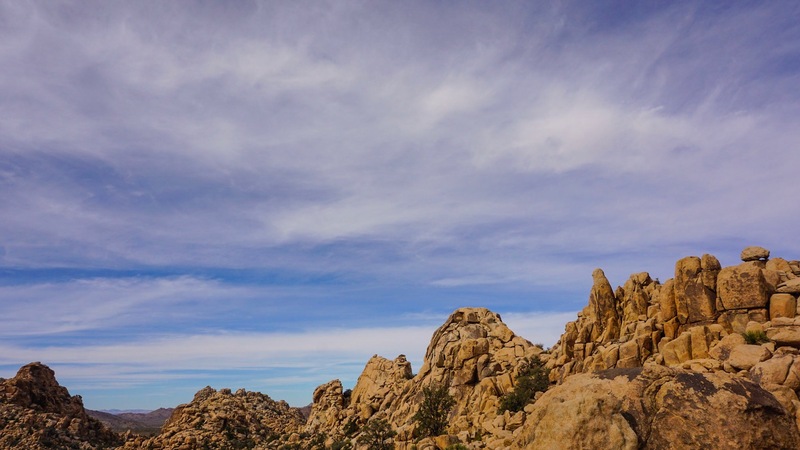 The hike also provides wonderful upclose views of the Joshua Trees. 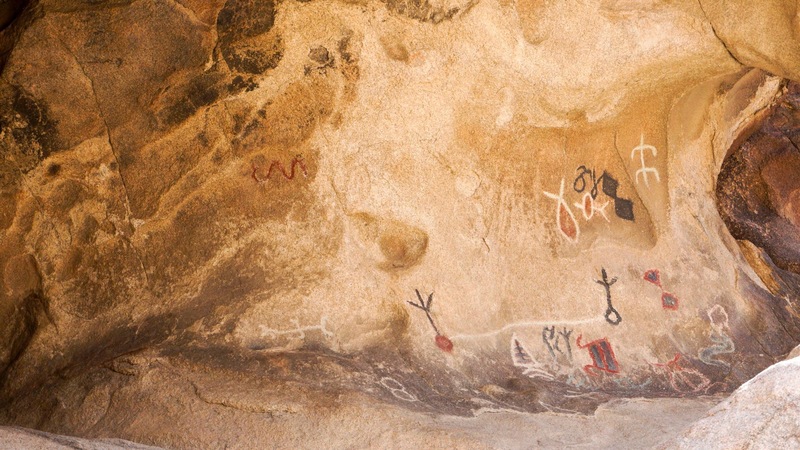 The trail also offers an upclose view of some ancient petroglyphs (cave art). 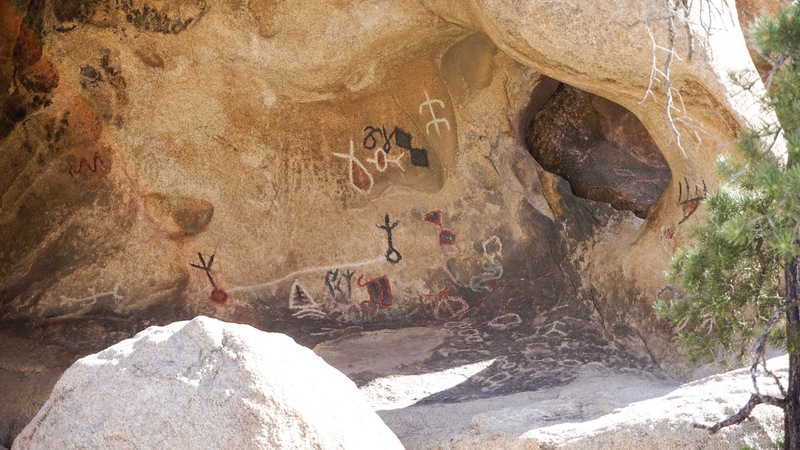 Unfortunately, this particular grouping of petroglyphs were “enhanced” with paint by a Disney film crew in the 1950s. 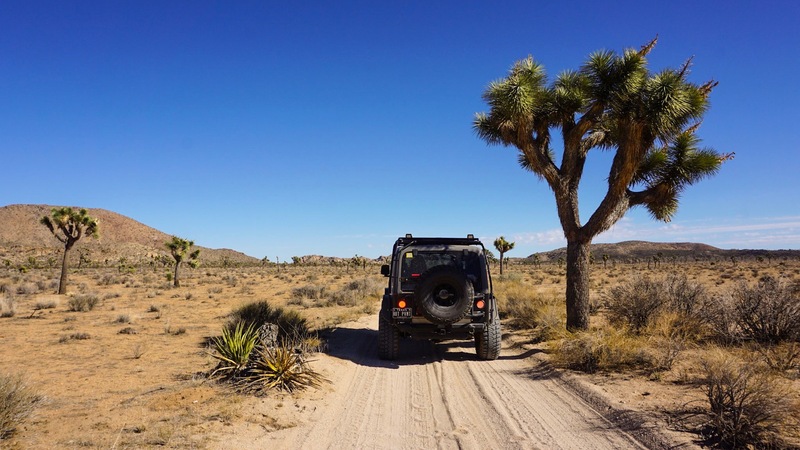 Our final adventure in Joshua Tree was a driving tour. We wanted to get off the beaten path for a bit. We chatted with the ranger at the Visitor Center and decided Geology Tour Road was a good bet. It was described as being accessible only by 4X4 high-clearance vehicles. 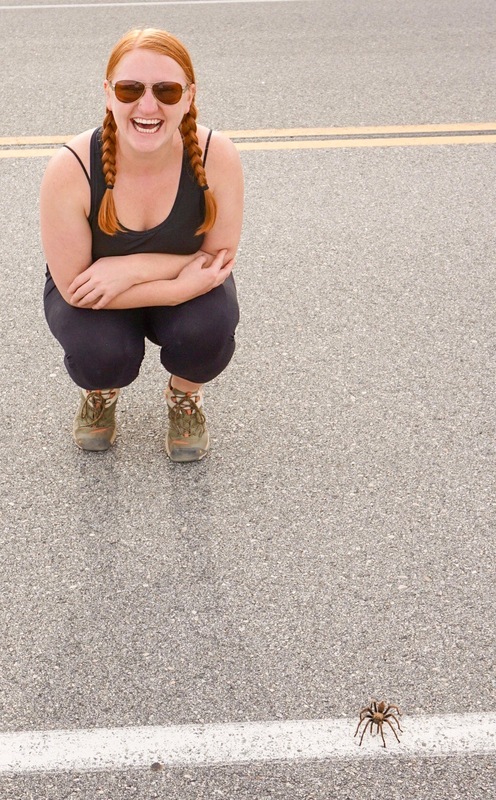 It was a ton of fun, but honestly, you could have driven this road in a Subaru hatch-back. 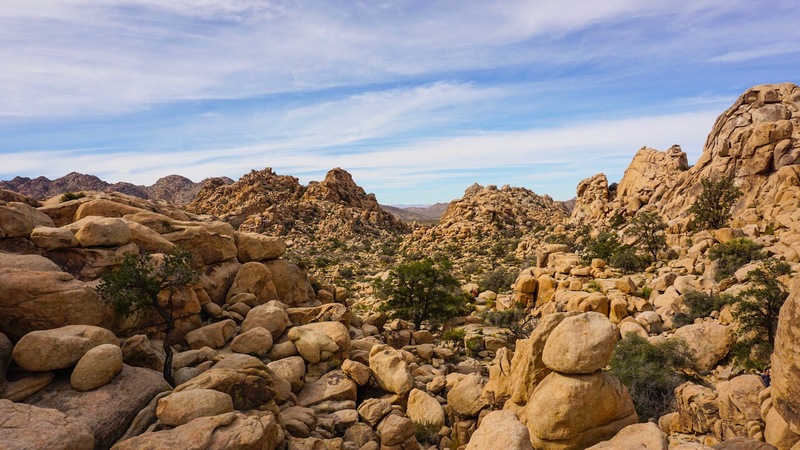 The road loops through the piles of boulders out to a flatter section of desert plants with mountains in the background. I took over about half-way through the drive. 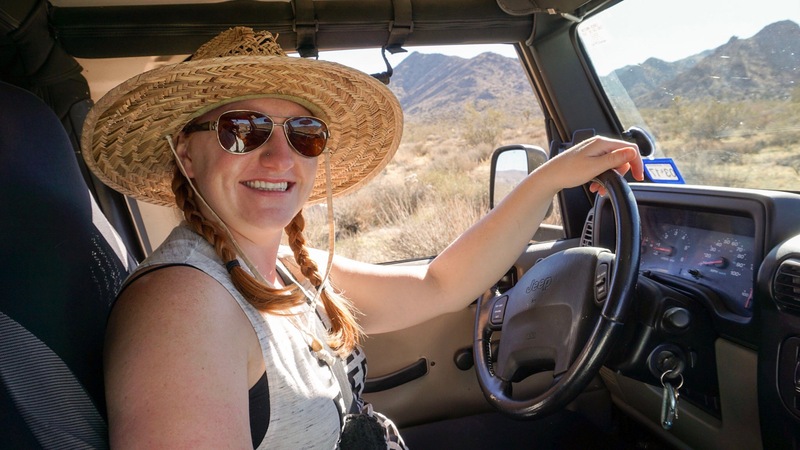 I’ve gotten pretty proficient at driving the manual Jeep (I still don’t like city traffic) but Brandon is still generally the driver when we go off-road. This was a fun change of pace and I think I did pretty well. My most successful photo-bombing to date. 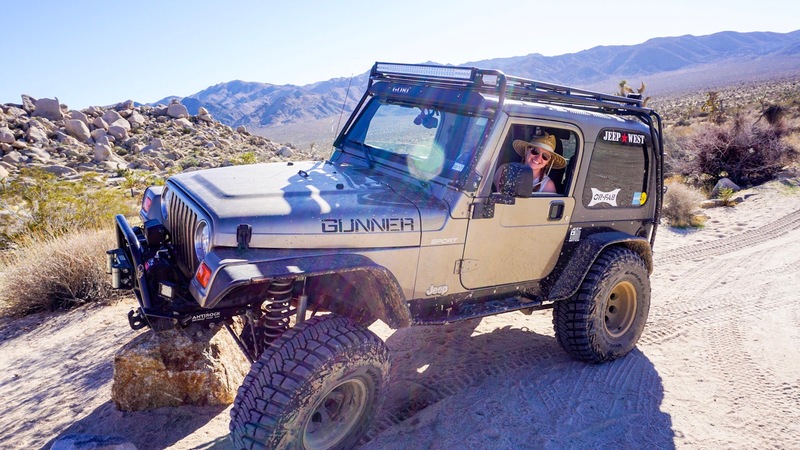 I was already behind the wheel when we made this stop so Brandon encouraged me to drive up onto the rock and “flex” as they call it in the Jeep world. This was my first time. 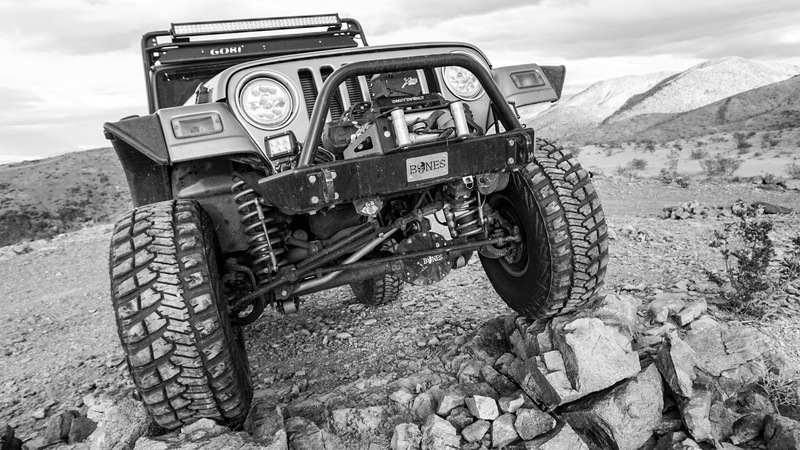 Apparently, parking funny on rocks ups your macho factor. Obviously, girls do it better! This is our last stop in California. But stay tuned, there are a lot of epic adventures on the docket before we break for turkey and mashed potatos. 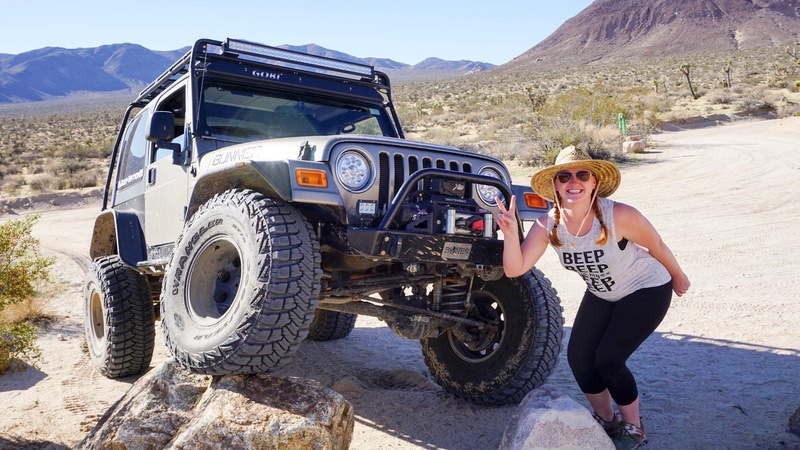 We still plan to visit Sedona, Arizona, hike Arches National Park, and tackle some of the epic Jeep trails oustide of Moab, Utah. Bet the stars at night were big and bright. Yes they were! Also, I just can’t read your comment without singing the next line! Thanks! It was a lot of fun. 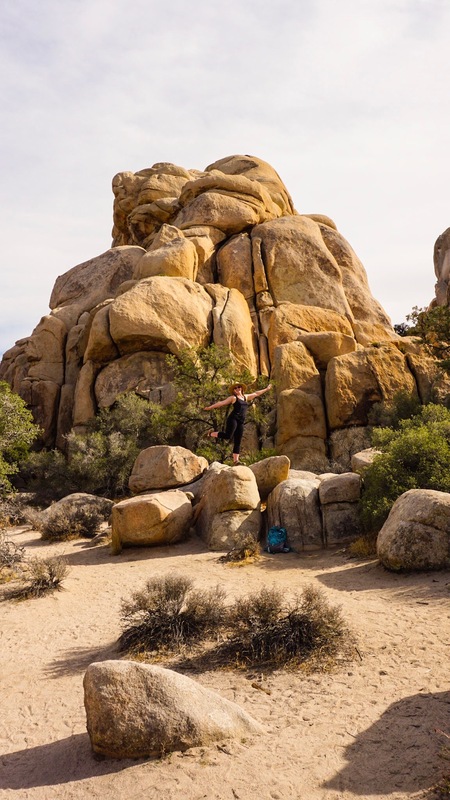 You would love Joshua Tree!